The Dead Sea (Arabic: البحر الميت‎; Hebrew: ים המלח) is both the lowest point on the Earth at 418 metres (1,371 ft) below sea level and falling, and the deepest hypersaline lake in the world at 330 m (1,083 ft) deep and 799 m (2,621 ft) below sea level. It is also one of the saltiest bodies of water on Earth with a salinity of about 30 %. This is about 8.6 times greater than the average ocean salinity. It measures 67 kilometres (42 mi) long, up to 18 kilometres (11 mi) wide, and is located on the border between the West Bank, Israel, and Jordan, and lies in the Jordan Rift Valley. The main tributary is the Jordan River. 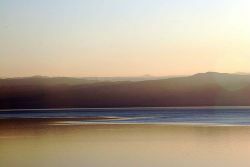 The Dead Sea has attracted interest and visitors from around the Mediterranean basin for thousands of years. It was a place of refuge for King David, it was one of the world's first health resorts for Herod the Great, and it has been the supplier of products as diverse as balms for Egyptian mummification to potash for fertilizers. In Arabic the Dead Sea is called Al Bahr al Mayyit meaning "the Dead Sea", or less commonly Bahr Lūţ meaning "the Sea of Lot". Historically, another Arabic name was the "Sea of Zoar", after a nearby town. In Hebrew the Dead Sea is called the Yam ha-Melakh - meaning "sea of salt", or Yam ha-Mavet - meaning "sea of death". In past times it was the "Eastern Sea" or the "Sea of Arava". To the Greeks, the Dead Sea was "Lake Asphaltites" (see below). The Dead Sea is located in the Dead Sea Rift, which is part of a long fissure in the Earth's surface called the Great Rift Valley. The 6000 km (3700 mile) long Great Rift Valley extends from the Taurus Mountains of Turkey to the Zambezi Valley in southern Africa. The Great Rift Valley formed in Miocene times as a result of the Arabian Plate moving northward and then eastward away from the African Plate. Around three million years ago what is now the valley of the Jordan River, Dead Sea, and Wadi Arabah/Nahal Arava was repeatedly inundated by waters from the Mediterranean Sea. 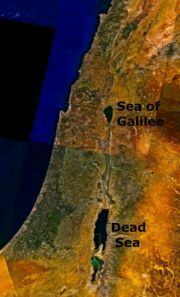 The waters formed in a narrow, crooked bay which was connected to the sea through what is now the Jezreel Valley. The floods of the valley came and went depending on long scale climatic change. The lake that occupied the Dead Sea Rift, named " Lake Sodom", deposited beds of salt, eventually coming to be 3 km (2 miles) thick. According to geological theory, approximately two million years ago the land between the Rift Valley and the Mediterranean Sea rose to such an extent that the ocean could no longer flood the area. Thus, the long bay became a long lake. The first such prehistoric lake is named "Lake Gomorrah". Lake Gomorrah was a freshwater or brackish lake that extended at least 80 km (50 miles) south of the current southern end of the Dead Sea and 100 km (60 miles) north, well above the present Hula Depression. As the climate turned more arid, Lake Gomorrah shrank and became saltier. 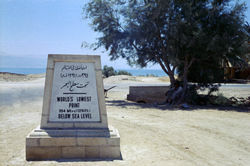 The large, saltwater predecessor of the Dead Sea is called "Lake Lisan". Mount Sedom, on the southwest side of the lake, is a giant mountain of halite. During 70,000 to 12,000 years ago the lake level was a 100-250 m higher than its current level. 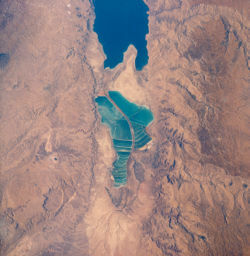 This lake was termed "Lake Lisan", which fluctuated dramatically with rising to highest level around 26,000 years ago, indicating very wet climate in the Near East. Sometime around 10,000 years ago the lake level dropped dramatically, probably to levels even lower than today. During the last several thousand years the lake has fluctuated approximately 400 m with some significant drops and rises. The Jordan River is the only major stream flowing into Dead Sea. There are no outlet streams. The northern part of the Dead Sea receives scarcely 100 mm (4 inches) of rain a year. The southern section barely 50 mm (2 inches). The Dead Sea zone's aridity is due to the rainshadow effect of the Judean Hills. The highlands east of the Dead Sea receive more rainfall than the Dead Sea itself. The mountains of the western side, the Judean Hills, rise less steeply from the Dead Sea than do the mountains of the eastern side. The mountains of the eastern side are also much higher. Along the southwestern side of the lake is a 210 m (700 ft) tall halite formation called " Mount Sedom". High oxygen content due to the high barometric pressure. Climatotherapy:- Treatment which exploits local climatic features such as temperature, humidity, sunshine, Barometric pressure and special Atmospheric constituents. Heliotherapy:- Treatment that exploits the biological effects of the sun's radiation. Thalassotherapy:- Treatment that exploits bathing in Dead Sea water. Balneotherapy:- Treatment that exploits black mineral mud of the Dead Sea. A tourist demonstrates the unusual buoyancy caused by high salinity. Until the winter of 1978-1979, the Dead Sea was composed of two stratified layers of water that differed in temperature, density, age, and salinity. The topmost 35 meters or so of the Dead Sea had a salinity that ranged between 300 and 400 parts per thousand and a temperature that swung between 19 °C (66 °F) and 37 °C (98 °F). Underneath a zone of transition, the lowest level of the Dead Sea had waters of a consistent 22 °C (72 °F) temperature and complete saturation of sodium chloride (NaCl). [ citations needed] Since the water near the bottom is saturated, the salt precipitates out of solution onto the sea floor. The mineral content of the Dead Sea is significantly different from that of ocean water, consisting of approximately 53% magnesium chloride, 37% potassium chloride and 8% sodium chloride (common salt) with the remainder comprised of various trace elements. The concentration of sulfate, SO42-, ions is very low, and the bromide ion concentration is the highest of all waters on Earth. Chlorides neutralize most of the calcium ions in the Dead Sea and its surroundings. While in other seas sodium chloride is 97% of the salts, in the Dead Sea the quantity of NaCl is only 12-18%. Comparison between the chemical composition of the Dead Sea to other lakes and oceans show that the salt concentration in the Dead Sea is 31.5% (the salinity fluctuates somewhat). Because of its unusually high concentration of salt, anyone can easily float in the Dead Sea because of natural buoyancy as a result of the higher density of the water. In this aspect, the Dead Sea is similar to the Great Salt Lake in Utah, in the United States. One of the most unusual properties of the Dead Sea is its discharge of asphalt. From deep seeps, the Dead Sea constantly spits up small pebbles of the black substance. 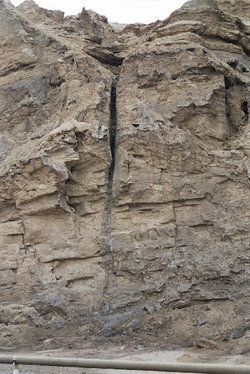 After earthquakes, chunks as large as houses may be produced. The Dead Sea area has become a major centre for health research and treatment for several reasons. The mineral content of the waters, the very low content of pollens and other allergens in the atmosphere, the reduced ultraviolet component of solar radiation, and the higher atmospheric pressure at this great depth each have specific health effects. For example: persons suffering reduced respiratory function from diseases such as cystic fibrosis, seem to benefit from the increased atmospheric pressure. Sufferers of the skin disorder Psoriasis also benefit from the ability to sunbathe for long periods in the area due to its position below sea level and subsequent result that many of the sun's harmful UV rays are reduced. The sea is called "dead" because its high salinity means no fish or macroscopic aquatic organisms can live in it, though minuscule quantities of bacteria and microbial fungi are present. In times of flood the salt content of the Dead Sea can drop from its usual 35% salinity to 30% or lower. In the wakes of rainy winters the Dead Sea temporarily comes to life. In 1980, after one such rainy winter, the normally dark blue Dead Sea turned red. Researchers from Hebrew University found the Dead Sea to be teeming with a type of algae called Dunaliella. The Dunaliella in turn nourished carotenoid-containing (red-pigmented) halobacteria whose presence is responsible for the colour change. Since 1980 the Dead Sea basin has been dry and the algae and the bacteria have not returned in measurable numbers. Many animal species make their homes in the mountains surrounding the Dead Sea. A hiker can see camels, ibex, hares, hyraxes, jackals, foxes, and even leopards. Hundreds of bird species inhabit the zone as well. 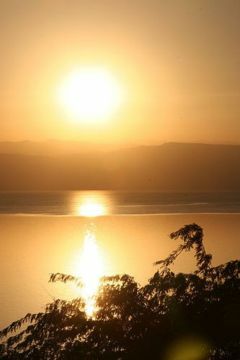 Both Jordan and Israel have established nature reserves around the Dead Sea. The delta of the Jordan river was formerly a veritable jungle of papyrus and palm trees. Flavius Josephus described Jericho as "the most fertile spot in Judea". In Roman and Byzantine times sugarcane, henna, and sycamore all made the lower Jordan valley quite wealthy. One of the most valuable products produced by Jericho was the sap of the balsam tree, which could be made into perfume. By the nineteenth century Jericho's fertility was a thing of the past. The human history of the Dead Sea goes all the way back to remote antiquity. Just north of the Dead Sea is Jericho, the oldest continually occupied town in the world. Somewhere, perhaps on the Dead Sea's southeast shore, are the cities mentioned in the Book of Genesis which were destroyed in the times of Abraham: Sodom and Gomorra and the three other "Cities of the Plain". King David hid from Saul at Ein Gedi nearby. The Greeks knew the Dead Sea as "Lake Asphaltites", due to the naturally surfacing asphalt. Aristotle wrote about the remarkable waters. During the Egyptian conquest it is said that Queen Cleopatra obtained exclusive rights to build cosmetic and pharmaceutical factories in the area. Later, the Nabateans discovered the value of bitumen extracted from the Dead Sea needed by the Egyptians for embalming their mummies. Prominent personages linked with the Dead Sea and its surroundings are Herod the Great, Jesus of Nazareth, and John the Baptist. Also in Roman times some Essenes had settled on the Dead Sea's western shore; Pliny the Elder identifies their location with the words, "on the west side of the Dead Sea, away from the coast ... [above] the town of Engeda" (Natural History, Bk 5.73); and it is therefore a hugely popular though not uncontested hypothesis today, that same Essenes are identical with the settlers at Qumran and that "the Dead Sea Scrolls" discovered during the 20th century in the nearby caves had been their own library. King Herod the Great built/re-built several fortresses and palaces on the Western Bank of the Dead Sea. The most famous was Masada, where, in 66-70 AD, a small group of rebellious Jewish zealots held out against the might of the Roman Legion, and Machaerus where, it has been argued from the Gospel according to Luke 3:20, that John the Baptist had been imprisoned by Herod Antipas and met his death. The remoteness of the region attracted Greek Orthodox monks since the Byzantine era. Their monasteries such as Saint George in Wadi Kelt and Mar Saba in the Judean Desert are places of pilgrimage. In Islamic tradition, the Dead Sea was about the land in which the Prophet Lut ( Lot in the Hebrew scriptures) lived. His tribe had done wrong and had therefore been given a punishment for such deeds. The punishment arrived when angels were sent down by Allah to Lut. The angels raised the land where the prophet's tribe lived and threw it back into the ground, causing the ground near the impact to cave in. Thus, the lowest land on Earth was formed because of this punishment. The sinners were destroyed and the followers were saved. Bedouin tribes have continuously lived in this area, and more recently explorers and scientists arrived to analyze the minerals and conduct research into the unique climate. Since the 1960s, tourists from all the over world have also explored the Dead Sea region. View of salt evaporation pans on the Dead Sea, taken in 1989 from the Space Shuttle Columbia. The southern half is now separated from the northern half at what used to be the Lisan Peninsula because of the fall of the level of Dead Sea. In the early part of the 20th century, the Dead Sea began to attract interest from chemists who deduced that the Sea was a natural deposit of potash and bromine. The Palestine Potash Company was chartered in 1929 (after its founder, Moses Novomeysky, a Jewish engineer from Siberia, worked for the charter for over ten years). The first plant was on the north shore of the Dead Sea at Kalia and produced potash, or potassium chloride, by solar evaporation of the brine. Employing Arabs and Jews, it was an island of peace in turbulent times. The company quickly grew into the largest industrial site in the Middle East and in 1934 built a second plant on the southwest shore, in the Sodom area, south of the 'Lashon' region of the Dead Sea. The Dead Sea Works Ltd. was established in 1952 as a state-owned company to extract potash and other minerals from the Dead Sea. From the Dead Sea brine, Israel produces (2001) 1.77 million tons potash, 206,000 tons elemental bromine, 44,900 tons caustic soda, 25,000 tons magnesium metal, and sodium chloride. On the Jordanian side of the Dead Sea, the Arab Potash Co. (APC), formed in 1956, produces 2.0 million tons of potash annually, as well as sodium chloride and bromine. Both companies use extensive salt evaporation pans that have essentially diked the entire southern end of the Dead Sea for the purpose of producing carnallite, potassium magnesium chloride, which is then processed further to produce potassium chloride. The power plant on the Israeli side allows production of magnesium metal (by a subsidiary, Dead Sea Magnesium Ltd.). The salt evaporation pans are visible from space. The Dead Sea is rapidly shrinking because of diversion of incoming water. 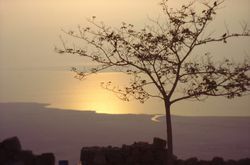 Between 1930 and 1997 it fell 21 m . Although the Dead Sea may never entirely disappear, because evaporation slows down as surface area decreases and salinity increases, it is feared that the Dead Sea may substantially change its characteristics. Since it is not realistic to cease using the Jordan River for human needs, one idea to save the Dead Sea is to channel water from the Mediterranean or the Red Sea, either through tunnels or canals. Although a Mediterranean structure would be shorter, Israel is now committed to building a Red Sea canal in deference to Jordan's needs. The plan is to pump water 120 m up the Arava/Arabah from Aqaba or Eilat, tunnel under the highest point of the Arava/Arabah valley, and then canalize the river of seawater as it falls 520 m to the Dead Sea. The desalination plant would be constructed in Jordan. On May 9, 2005, Jordan, Israel, and the Palestinian Authority signed an agreement to begin feasibility studies on the project, to be officially known as the " Two Seas Canal". The scheme calls for the production of 870 million cubic metres of fresh water per year and 550 mega watts of electricity. The World Bank is supportive of the project. Overpumping and mineral extraction by Israeli and Jordanian companies are drying up the Dead Sea with the result that the shoreline is receding three feet a year. The southern third of the lake has vanished, and Friends of the Earth Middle East doubts the famously salty lake can ever be rehabilitated. One woman in the Israeli resort of Ein Gedi stated that when she moved to the area from South Africa in 1978, the shoreline was just 30 feet from the road. As of September 2006, the spa has to drive its guests a mile to the water. Visitors flock there to sightsee and bathe in mineral-rich waters. 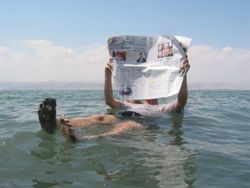 People who believe the Dead Sea is good for them will still go there on vacation. Nobody can say how much longer the sea will exist for tourists. The world's lowest road runs along the Israeli shores of the Dead Sea at 393 m (1,289 ft) below sea level. This road was also made famous in Naomi Shemer's song Jerusalem of Gold. Besides the unique water of the Dead Sea itself, there are also health spas and hot springs along the shore. There is also the Israeli Atractziah Water Park (across from Kalia Kibbutz) and swimming pools in the large Hotel Resort. West Antarctica's Don Juan Pond has a greater salinity than the Dead Sea, at 18 times ocean salinity. The deepest point on the Earth's crust is the Mariana Trench, a submarine trench in the western Pacific Ocean. There are ice-covered depressions on the continent of Antarctica that are deeper than the Dead Sea (such as the Bentley Subglacial Trench). The world's deepest lake is Lake Baikal in Siberia, Russia.